At a September 16 press conference, Cuba’s Foreign Minister, Bruno Rodriguez, commented on the U.S. embargo of Cuba and the upcoming visit to the island of Pope Francis. 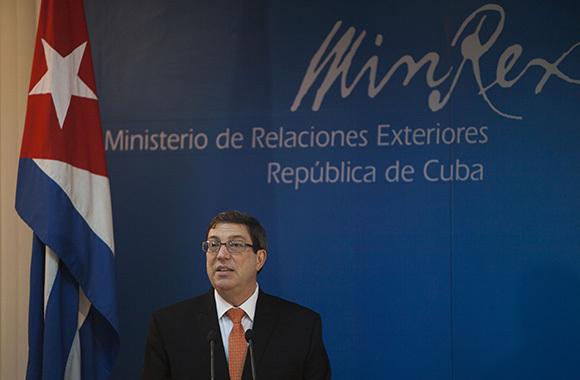 The Foreign Minister announced that Cuba’s resolution against the embargo would be offered at the U.N. General Assembly on October 27. It will have the same text as the resolutions adopted by the Assembly for the last 20 years with new paragraphs discussing the restoration of diplomatic relations between Cuba and U.S. President Obama’s asking Congress to end the embargo, but the embargo’s remaining in effect. Rodriguez asserted that the economic damage caused to the Cuban people by the embargo or blockade against Cuba, now totaled $755,833,000. In addition, there has been alleged damages to different sectors of the Cuban economy of $192,121,000 for a total of $947,954,000. The Foreign Minister also said that the Cuban people will welcome the Pope with respect, appreciation and hospitality. “The Pope’s visit with the massive participation of believers and unbelievers will be a momentous event for our people, our culture and the Cuban nation.” This visit will be covered in real time and with social networks in order to reach directly and quickly the most people possible. Rodriguez expressed the Cuban government’s appreciation and gratitude to Pope Francisco for his support in the mediated process between the governments of the U.S. and Cuba. Francisco, Bruno Rodriguez: blockade of Cuba is an absurd, illegal and morally unsustainable policy (+ photos, video and graphics), CubaDebate (Sept. 16, 2015). As discussed in a prior post, on October 28, 2014, the U.N. General Assembly approved a resolution condemning the embargo (blockade), 188 to 2. At that time Foreign Minister Rodriguez alleged the damages were $1.1 trillion. Whether and how that number can be reconciled with the new number of nearly $948 million is not explained. An article by Reuters says that Cuba now estimates its damages from the embargo at $121 billion. I am still confused about the amount of this claim.